We all have little pockets between our teeth which tend to accumulate food, even when we brush regularly. The presence these moist food nutrients combined with a neutral pH and body warmth to provide excellent growth conditions for bacteria. Our bodies defend against these bacteria with a class of phagocytic leukocytes whose nuclei are highly variable with 3-5 lobes (therefore known as polymorphonucleocytes, PMNs or “polys”). The cytoplasm in these cells is rich in lysosomes which contributes to the staining properties when the cells are stained with Wright’s stain, earning the appellation “neutrophil.” (The numbers of these bacteria-fighting WBC increase dramatically during acute infections such as appendicitis.) 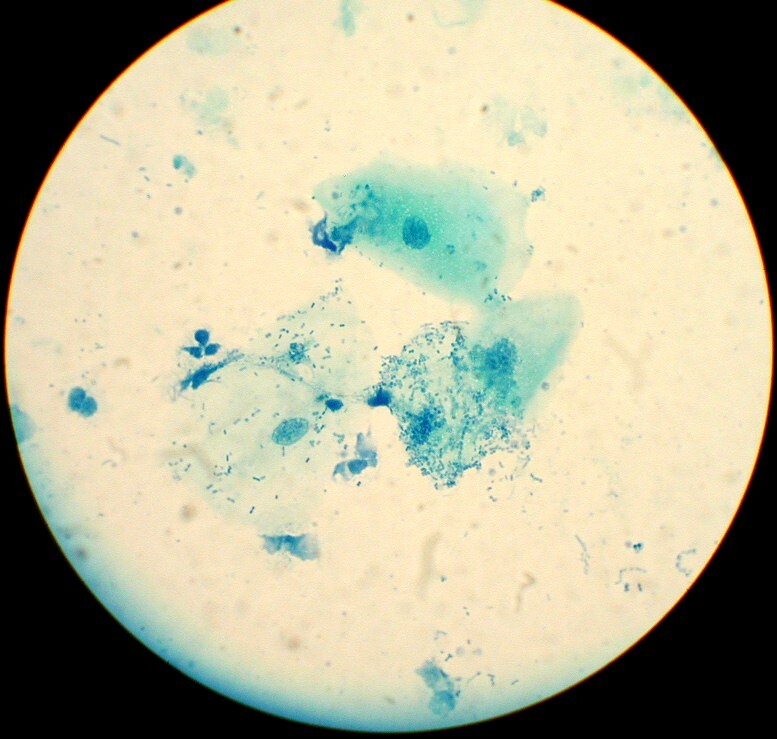 One will also see occasional squamous cells from the periodontal mucosa. The number and variety of bacteria found in this trapped material can be amazing. 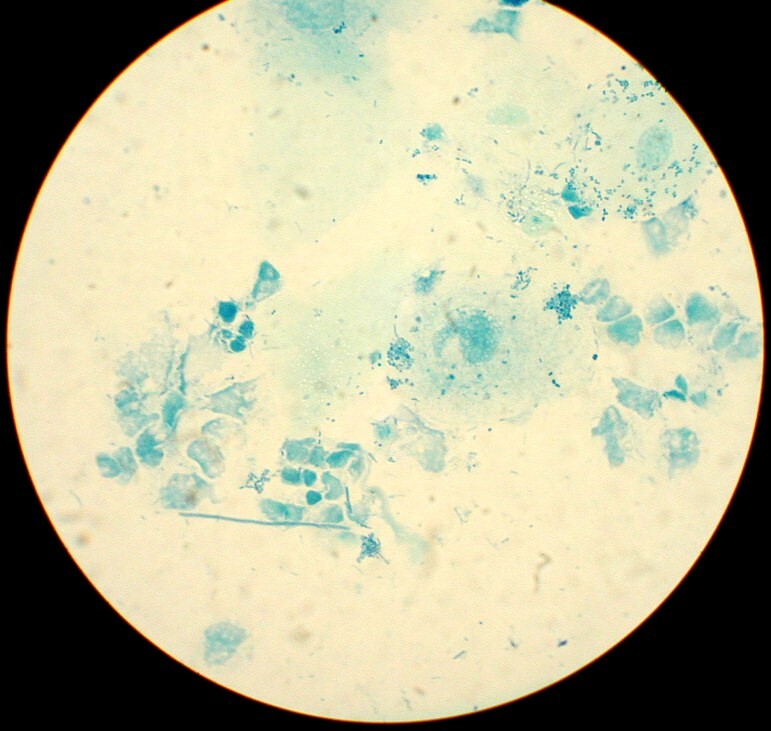 You should be able to find representatives of cocci, bacilli and spirilla morphologies. EQUIPMENT: Same as for Buccal Smear. 1. Prepare a clean slide, place a small drop of dH2O in the center. 2. Collect specimen by using a tooth pick to dislodge a small bit of material lodged on the tooth surface at the gum line, or between your teeth. 4. Fix the smear by briefly passing the slide through a flame. 5. Stain the smear by placing a drop of methylene blue or other basic stain on the smear, spread it out so the whole smear is covered. Let sit for 1-2 minutes. 6. Rinse with tap water for 2 seconds to remove excess stain. 8. Dry over gentle heat by passing the slide briefly through the flame. 9. Examine under the microscope, locating a properly spread and stained field. Work your way up to the 100x oil immersion objective (see separate protocol). 10. Illustrate eukaryotic cells which are present (leukocytes and squamous cells ), and the variety of the bacterial morphologies which you see. Label them according to their morphology. Aristotle 350 BC Taught Alexander the Great to boil drinking water & bury feces to prevent disease. Fracastorius 1546 (1478-1553) Theory of contagion: disease infection can be caused by minute bodies (“germs”) capable of self-replication, transmitted from infector to infected. Said to have named syphilis. Leeuwenhoek 1670s improved microscope, first to observe bacteria. Ignaz Semmelweis 1848 (1818-1865) In charge of lying-in hospital in Vienna. Childbirth death rate: Ward II midwives = 3%, Ward I, medical faculty: ~10%. Phys. friend died of autopsy wound, S&S same as puerperal fever. Proposed etiology: “cadaveric particles.” Smell not removed by hand washing, but calcium hypochlorite: Ca(OCl)2 did. Chloride of lime washing reduced puerperal fever death rate 12.4% to 1.27%. Iatrogenic disease. Joseph Lister 1860s (1827-1912) Introduced use of antiseptic during surgery: phenol in surgical dressings and sprayed into the air. Wound infections dropped dramatically, thus due to bacteria. Louis Pasteur 1865 Demonstrated that spoilage of wine was due to abnormal microorganisms. Then asked by French gov to study PEBRINE: (pa-breen) another disease of silkworms, caused by a protozoan. Could be halted by identifying diseased worms, removing and destroying. KOCH’S POSTULATES are criteria by which a bacterium may be said to cause a disease. 1 microscopic examination found bacillus in blood of all animals with anthrax. Loeffler developed nutrient broth and stains. Walter Hesse’s wife suggested using agar to solidify. Petri developed shallow dishes for culture. 3 injected pure culture into healthy animals, they got anthrax. 4 isolated same organism from animals experimentally given anthrax. Chamberland 1884 Showed that tobacco mosaic disease was caused by “filterable’ agent (i.e., not bacteria) therefore. called virus. Edward Jenner 1798 Saw peasants do this in Turkey. Inoculated susceptible person with pus from cowpox lesion, conferred resistance to Small Pox. Vaccination comes from vache, cow in French. Erlich 1910 Searched for “magic bullet” would poison pathogen but not patient. Developed salvarsan, an arsenic compound against syphilis. Flemming 1928 (1881-1955) Noted inhibition of Staphylococcus growth on plate contaminated with Penicillium notatum. Discovered penicillin.